The bridge at the Seventh Day Adventist Academy near Milo is one-of-a-kind in Oregon covered bridge history. The covering certainly is not a structural necessity but fills an aesthetic need, as it is Oregon's only steel bridge housed in wood. The World Guide Number now ends with a letter, indicating the span is not a true truss supported bridge. 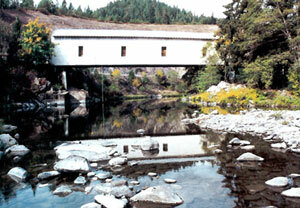 Since 1920, residents had a covered bridge serving the academy across the South Umpqua River. When the wooden covered bridge was replaced with a steel span, the community felt it had lost a part of its identity. The steel structure was then modified to include the wooden housing, and today the white covered bridge stands as a reminder to the residents of their previous covered bridge. The bridge is privately owned and maintained by the Seventh Day Adventist Church. The area was settled prior to the 1880s and the post office was established in 1884. Originally known as Perdue, the name was changed to Milo in 1923 when a community member suggested it be named Milo after her husband's birthplace in Maine. The Milo Academy Bridge is one of only two covered bridges in the Oregon Covered Bridges Thematic Group which do not have a timber truss support.